Year 2009 (early Spring), leaf-off, natural color orthoimagery acquired by the eCityGov Alliance for partnering cities - Mercer Island, Bellevue, Kirkland, Bothell and Shoreline. Vendor was MJ Harden. Pixel resolution is 0.25 foot. Alliance, eCityGov, 201003, 2009 eCityGov Alliance Natural Color Orthoimagery: Aerials Express, King County; WA. High-resolution, high-accuracy data for multiple business purposes. Data acquired from eCityGov Alliance in March 2010 via portable harddrive and DVD. Data was copied to workspace. Compressed MrSid versions (20x) were created for each tile for preliminary QA, horizontal accuracy analysis, and completion of extent shapefile. No spatial index was delivered with the data. A python routine was created to create a photo centroid layer. This point layer was buffered by 1600 feet to create a polygon footprint index. 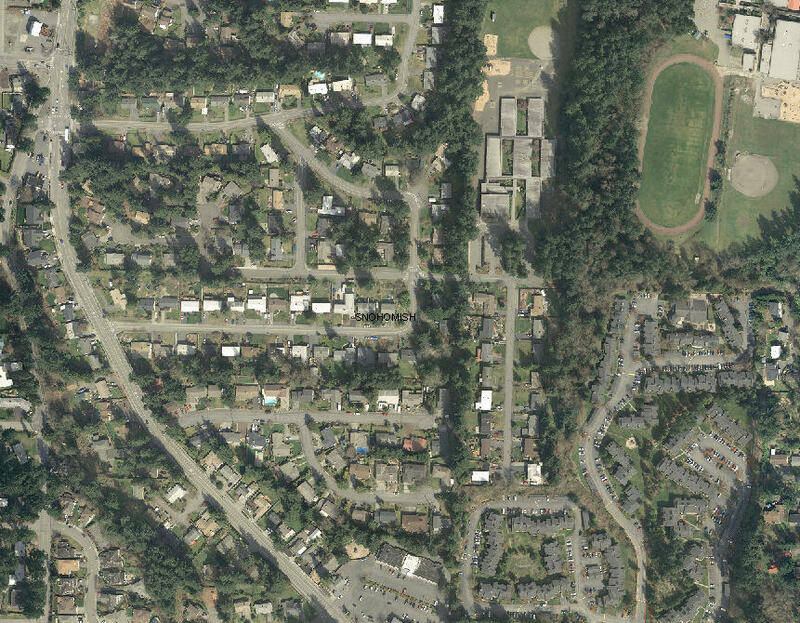 The photo center to edge is only 1500 feet, but the buffer was created larger than the image because the delivered tiles extent coincides in places with the King County 7500 grid. The overlap ensures that tile selection during subsequent processing does not miss an edge tile. MrSid (v7) was used to create Generation 3 SID (lossless) mosaics in the King County 7500-ft tiling scheme. 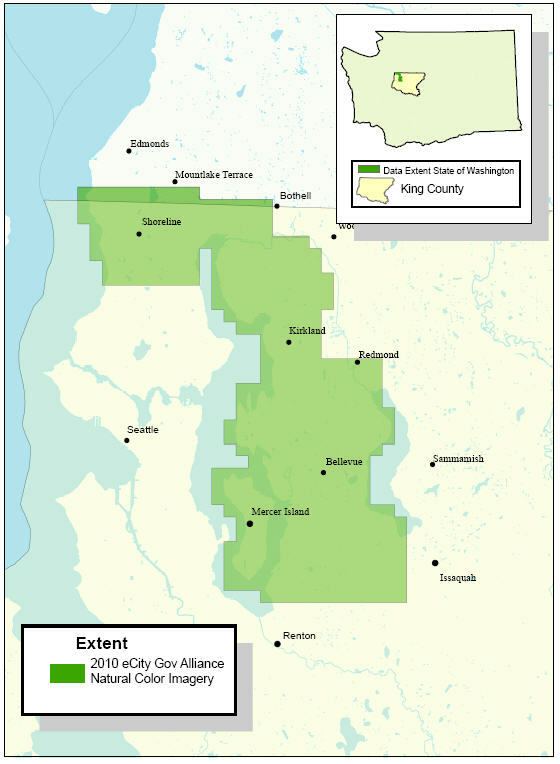 Another similar routine was used to create Generation 3 mosaics (15x compression) in the King County Township-Range tiling scheme. Redefined Projection for all sids to be compliant with King County standard. The database size was too large to mosaic as a single sid even at high compression. The data was resampled to 6 inch and a mosaic was also created for the affected Northwest Zone tile (35x compression) . A key region mosaic was created at 50x compression. Even though the key region mosaic covers that same area as the zone mosaic, it provides the complete dataset in a smaller file footprint. An analysis of 78 control points (70 known ground control and 9 'blind') showed a RMS (root mean square) accuracy of 0.39 feet in the X direction and 0.22 feet in the Y direction. Not all 7500 foot tiles and Township-Range tiles along the edges of the project area are complete image tiles. As a licensee, King County is permitted to copy, analyze, print, and otherwise use the data at the licensee's sole discretion. Any use of the data in the production of printed maps or other graphic products shall credit the Licensor (eCityGov Alliance) as the source agency and copyright holder of the data in such products. The data may be distributed to all authorized users within the licensee's organization, but no distribution of the data is permitted to staff and/or programs of external organizations, except by prior agreement of Licensor.